See it on display in Furniture Hall at our Virginia Beach location! Limited stock of the 5-piece package, sideboard and additional expansion leaves also available. 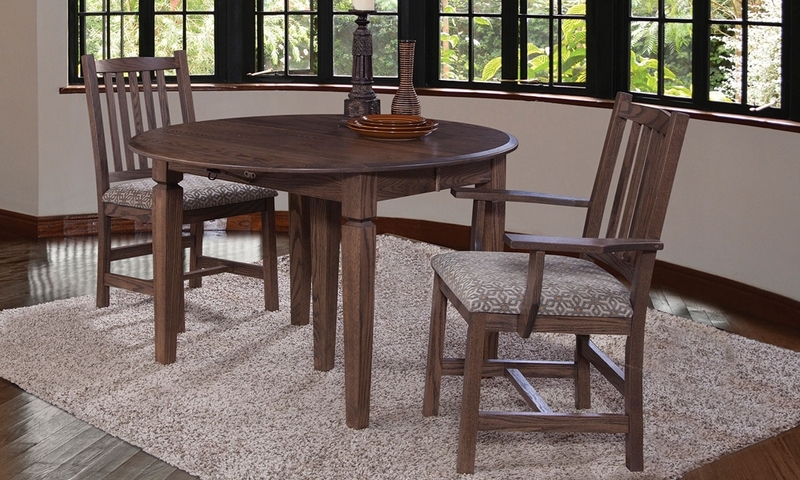 Your dining room will be ready for any occasion with the Georgetown collection from Conrad Grebel. The set centers around a versatile 42-inch oval leg table with 10-inch drop leaves on both sides. Two included expansion leaves allow the table to reach 72 inches in width, but additional leaves can be purchased to extend it up to a stunning 108 inches. Four slat back side chairs and two arm chairs round out the room to accommodate your seating needs. All pieces are handmade in the family workshops of Amish and Mennonite craftsmen using traditional methods and solid oak wood in a Michael's hand-finish, protected by a 360-degree varnish. Art for illustration: Set includes 4 side chairs and 2 arm chairs, and is currently available crafted from solid oak in Micheal's hand-finish.